Save on scientifically proven leather care. The Wolfgang Leather Care Combo cleans and conditions leather upholstery using advanced, pH balanced formulas. Wolfgang Leather Care Cleaner gently cleans leather without over-drying. Then Wolfgang Leather Care Conditioner penetrates and moisturizes the leather. These two steps will preserve your leather seats for years to come! Wolfgang Leather Care Cleaner cleans leather seats without overdrying. Apply Wolfgang Leather Care Conditioner with a clean poly foam or microfiber applicator pad. Wolfgang Leather Care Cleaner is a gentle, pH balanced, 100% biodegradable cleaner which utilizes the natural cleaning strength of citrus to remove virtually any dirt, grease, ink, oil, or spills from your leather. It penetrates deep into the pores and gently lifting away foreign particles, pollution and contaminants, including microscopic dirt particles that build up over time. 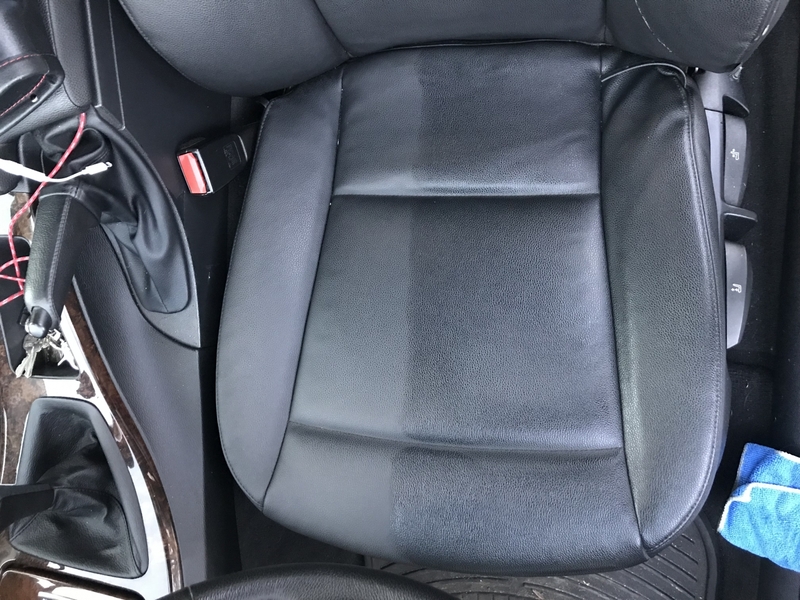 This water-based, pure cleaner contains no petroleum distillates, silicon oils or gloss agents, therefore will not dull, stain or cause drying of your leather. Wolfgang Leather Care Conditioner is a silky, lavish lotion that penetrates and nourishes leather of all ages, even surface- and vat-dyed hides. It contains ingredients derived from nature, such as lanolin, mink oil and natural oils--essential to the vibrant health and long life of your leather. This formula is potent enough to restore neglected leather to its former beauty and resiliency. UV protection is added to Wolfgang Leather Conditioner to preserve and protect from sun damage, fading, drying, cracking and brittleness that occurs naturally with age. Regular use of Wolfgang Leather Care Conditioner will leave your leather soft, supple and inviting, with a warm, natural leather aroma. This soft, absorbent applicator spreads products evenly and neatly. 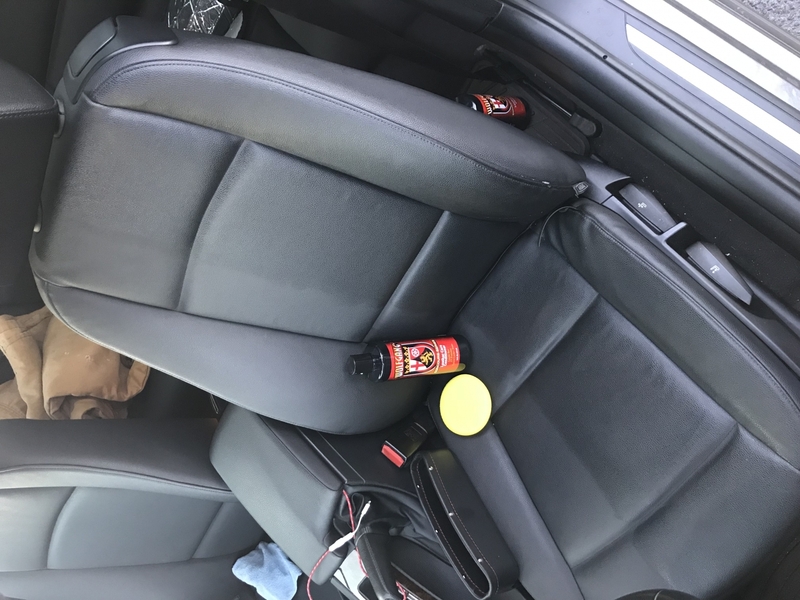 The foam is excellent for applying Wolfgang Leather Care Conditioner to your fine leather interior. This universal applicator is made of quality closed cell soft poly-foam so it's pliable, strong, and efficient. The applicator is washable and reusable. The Wolfgang Leather Care Combo is a tremendous value! By maintaining your vehicle's leather upholstery, you're helping maintain the value of your vehicle. There's no better way to do that than with Wolfgang's excellent leather cleaner and conditioner. A total retail value of $51.97. Save $11.98! Bought the cleaner & conditioner package for my Avalon's almond-colored leather seats. I used a leather brush (Griot) to apply and scrub the cleaner in, it lifted out lots of grime. The clean seats took the conditioner very well and left them shiny but not greasy. This is the best leather cleaner and conditioner product I've ever used. Worth every cent. ConsExpensive but you get what you pay for. Not going to use them on my seats because I donâ€™t want to waste it and they are leatherette rather than real leather. Great product. Cleaned very well and brought back a deep shine to the leather. I can actually feel a difference. The product does a good job in nourishing the leather on poorly keep motorcycle seat with fading. I think applying a couple more treatments will bring the seat back to its natural beauty.